Russell Gough received his BSc, BE and MEngSc from The University of Sydney. He worked at the Fleurs Synthesis Telescope at the University of Sydney until 1981, when he moved to West Germany to work at the Max-Planck-Institut fÃ¼r Radioastronomie, in Bonn. In 1983, he returned to Sydney to work on the development of cryogenically cooled, low-noise FET amplifiers for the CSIRO Australia Telescope project. 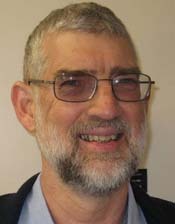 In 1989, he moved to the Paul Wild Observatory, Narrabri, to work on the installation and maintenance of the receiver systems for the Australia Telescope. Since 1994, he has worked at the CSIRO Radiophysics Laboratory where he was involved in the design and construction of a number of new millimetre-wave receiver systems. These have included 12 mm wavelength receiver systems for antennas at Parkes, Mopra and Shanghai. He was involved in the design and construction of cooled, Indium Phosphide, monolithic microwave integrated circuit, low noise amplifiers for the 12 mm and 3 mm the receiver systems for the Australia Telescope National Facility. He was a joint recipient of the 2002 CSIRO Medal for Research Achievement for Ultra Fast Integrated Circuits.